Craftsmen recently updated the North Shore Road sign so you won't miss the turn-off. Pictured (from left) is Ward Whitaker, and Bryce Mode, Mike Adams. Photo credit: Kristine Lowder. The Elip Creek trail offers choice opportunities to soak up some solitude amid some of the most spectacular rain forest scenery in the Quinault area. 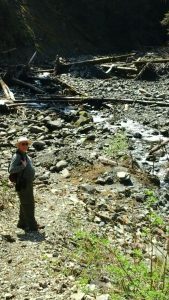 A classic Olympic Peninsula day hike, the trail begins roughly 12 miles northeast of Lake Quinault along the North Fork Quinault River Road. This backcountry trail is about 13 miles round trip. Don’t let the mileage intimidate you. This hike offers fresh air, sunshine, and landscape that looks like it fell out of the Emerald City as it winds through an outrageous old growth rain forest following the route of the 1889-90 Press Expedition. The trail is mostly level and relatively easy – except for the rocks – lots and lots of rocks. You climb some, but the rise is gentle, not hamstring-hollerin’ steep. Plus, you get to spend the day amid some Really Big Trees – towering Sitka spruce, soaring western hemlocks and moss-draped maples – tucked beneath the crown of the Olympic Mountains. 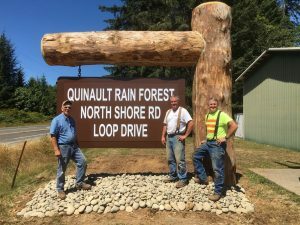 Craftsmen recently updated the North Shore Road sign so you won’t miss the turn-off. Pictured (from left) is Ward Whitaker, and Bryce Mode, Mike Adams. Photo credit: Kristine Lowder. Start out just past the North Fork ranger station on a meandering abandoned road. Climb gently until the first creek crossing at about 0.2 miles. Continue through a lush landscape along a bench that hugs the North Fork Quinault River. You’ll reach a spur trail to Wolf Bar at about 2.5 miles. Look for the sign. Nestled next to the Quinault River, this quiet, primitive campsite includes split logs for a rest or picnic stop. You can lunch and listen to the Quinault River kick up a watery cacophony as it trips over endless boulders. The trail sign for Elip Creek is clearly marked. Photo credit: Kristine Lowder. The trail snakes away from the river after Wolf Bar, descending and climbing to Halfway House at about 5.1 miles in. Halfway House was a commercial lodge which provided warmth and hospitality to hikers headed for the Low Divide in the 1920s and 30s. It’s nearly impossible to find a trace of the lodge now. But this wide, grassy spot along the trail is another nice picnic or rest stop. You can also glimpse multiple small waterfalls crashing into the river. Chris and Josiah Lowder well know! Photo credit: Kristine Lowder. You’re getting close to Elip Creek when you reach Wild Rose Creek (in Jefferson County, technically). There’s no bridge. Wild Rose can be a very hazardous creek crossing, especially in early spring when the water’s high and running fast. Beware the descent into the canyon through which this creek canters. The ground is shale-strewn and gravelly. Slips and slides are easy over the unstable footing. Use extra caution if you choose to ford the creek via the log snag. Logs may be slippery and are notoriously unstable. Be sure to wear waterproof boots. If you clear Wild Rose Creek, continue on the trail until you hit a clearing near another creek. Watch for the weather-beaten sign proclaiming your destination. It’s on your right. You can’t miss it. Elip Creek Camp is about 6.5 miles from the trail head, out in the middle of no where. 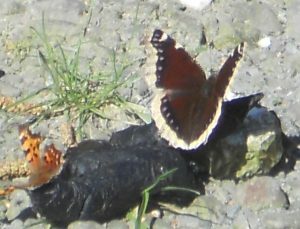 Butterflies abound on the trail to Elip Creek in the spring. Photo credit: Kristine Lowder. This is a good trail for wildlife watching if you hike it in late fall or early spring. Croaking frog choruses and bird song crochet most mornings. Butterflies glide through thick stands of Nootka rose and sword fern. Hummingbirds frequently whiz past in a feathered rush to points unknown. Evidence of deer, elk, raccoon, beaver, and coyote abound. We’ve also found cougar and bear tracks on this trail, so keep an eye out. Mom Tip #1: Although scenic and tranquil, the Elip Creek Trail probably won’t win any awards in the Best Maintained category. There are three new cedar foot logs across boggy portions of the trail early on. Beyond that, and it’s the old, decrepit foot logs, which can be as slick as glass. Expect to scramble over boulders and downed logs. Ford some bridge-less creeks. Negotiate a fair amount of tangle foot. The footing can be treacherous, especially near creeks and streams. Waterfalls at no extra charge. Mom Tip #2: Wear a hat. Dress in layers. Bring extra food. Ditto plenty of water. There isn’t any out in the middle of nowhere. DO NOT DRINK out of area lakes or streams, no matter how tempting. Like I said, Elip Creek is about 13 miles round trip. It’s longer if the creeks are high and you have to head downstream to cross, or build your own bridge. 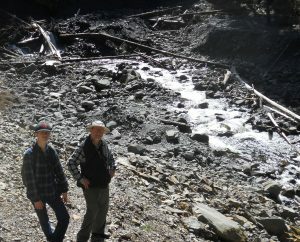 A true-blue, 100% DIY hike, this trail is one of the best in the region to enjoy the Olympic rain forest at its finest. It offers fabulous glimpses into local flora and fauna. It’s also a great place to “get away from it all” without going too far from home. To get to the trail head from the north, turn east off U.S. Highway 101 on to the North Shore Road. Drive 17.6 miles to the trailhead. 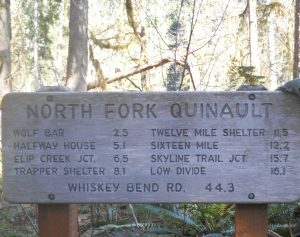 It’s located at the end of the road at the North Fork Ranger Station. From the south, turn east off U.S. Highway 101 onto the South Shore Road. Drive about 12.8 miles to a bridge crossing the Quinault River. Cross the bridge. Turn right on the North Shore Road. Drive about 3.3 miles to the trail head. You’ll pass the parking area for Irely Lake. The unpaved, pot-holed road ends at the ranger station on your left. Park and the trail head is directly ahead of you. It’s clearly marked. 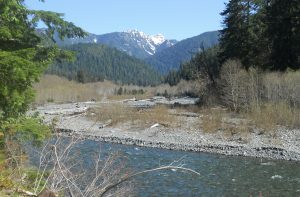 Part of the Elip Creek hike hugs the rushing Quinualt River. Photo credit: Kristine Lowder. Be sure to hit the Elip Creek trail early and enjoy some of that oh-so-rare Grays Harbor sun! The hike is rated “moderate” and is suitable for older kids. Families with young children may want to turn around at Wolf Bar. 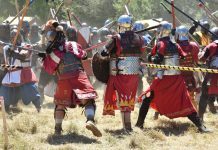 For more information, visit the National Park Service website.